In this unit you will learn more fretted notes on the sixth string and a few unique meters. ‘F♯’ and ‘G♭’ are enharmonics. To play ‘F♯’ or ‘G♭’, fret the second fret on the sixth string. 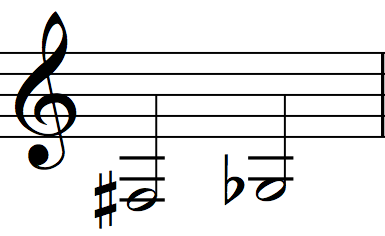 ‘G♯’ and ‘A♭’ are enharmonics. To play ‘G♯’ or ‘A♭’, fret the fourth fret on the sixth string. You already learned to read this note as the open fifth string. However, this same pitch can be played as the fifth fret of the sixth string as well. The meter above is in compound duple. Each beat is equal to a dotted half note and is subdivided into three equal parts. Each subdivision is represented by a quarter note. It has the same feel as 6/8 meter. You can practice this meter in Capriccio. The meter above features three beats per measure. Each beat is represented by a half note. The half note beat often corresponds with a slower tempo. Further, half notes have the potential to be subdivided further than quarter notes. As a result, meters with a half note pulse often showcase highly-ornamented melodies, as is the case in European dance music from the Baroque era. You can practice this meter in Courante. The meter above features one beat per measure. Each beat is a half note. This meter can apply to some European music from the Renaissance, but is rarely used today. You can practice this meter in Con qué la lavaré? The example above is in mixed meter. A piece in mixed meter will feature two or more different time signatures in the same piece. New time signatures appear at the beginning of a measure. Subsequent measures continue in the previous time signature until a new time signature is introduced. You can practice this meter in Mark Popeney’s Brief Moments, After. Meters that do not fit into the duple, triple or quadruple metric groupings are referred to as complex. Often, the beats in complex meter are grouped asymmetrically. Meters with additive rhythms feature a time signature in which the top number can be broken into two or more asymmetrical beat groupings. Sometimes the top number of the time signature is written as an addition equation to reference the exact subdivisions. 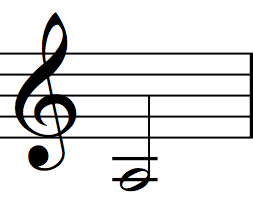 Many musical traditions feature song forms in additive meter. Much of the world’s music was (and is) orally transmitted. Musicians in these traditions rely on memory and their knowledge of the style, not notation. A few of these traditions have recently adopted music notation. However, music notation often falls short of communicating the stylistic nuances of a tradition. If a piece is inspired by an oral musical tradition, I suggest you research its style, culture and form. The meters introduced in this unit are not as complicated or challenging as they may appear at first glance. Many of them are associated with dances. A piece in mixed, additive or unusual meter can seem difficult when looking at its notation, but is actually intuitive when you find its groove. Often a piece’s rhythmic logic just needs to get off the page and into the body. Before you start sight-reading a piece, spend time moving and singing with the groove of its meter. If you can’t fly then run, if you can’t run then walk, if you can’t walk then crawl, but whatever you do you have to keep moving forward. —Martin Luther King Jr. The Guitar 1 part of the next exercise was originally a vocal melody. Play the melody on the guitar first and then, if you want, try to sing it too.